I’m not really a dress girl. I don’t like to be dressed up. Jeans and a t-shirt, or pants and a blouse (if I need to look like more of an adult), are much more my speed. That being said, there is something about the simplicity of a dress. It’s one item, throw it on and you’re done thinking about your outfit for the day. AND when I am faced the with prospect of melting into a puddle on the street every time I leave the house, sometimes a dress really is the only option. That’s why I settled on the dress and sneakers combo. Sure, it’s a dress, it’s dressy. But add sneakers, now it’s a cool dress. You’re a cool girl in an unfussy, cool outfit. You know what I mean? In a dress and sneakers, you are an unfussy, cool girl who can also go for a quick jog around the block and not melt into a puddle. You win. Thank you to Alyse Archer-Coite‘s style for inspiring this post! 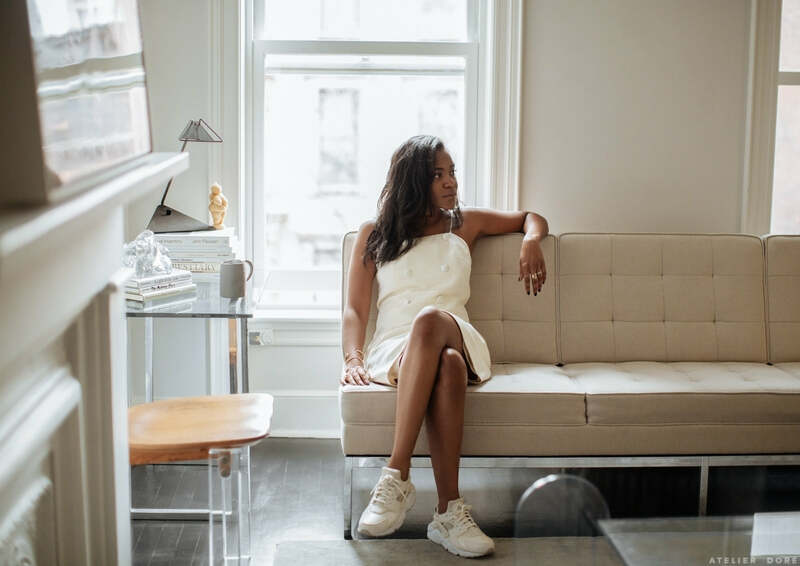 Alyse is the Director of Culture & Programming at the design firm A/D/O and an all around stylish lady, stay tuned for a few more posts to be inspired by her! Great post! Love her style. It feels though that she is more concerned about how she comes across/ is perceived as (basically ‘cool’ and ‘unfussy’) rather than how SHE really wants to feel when she gets dressed. Isn’t that moving away from your own sense of style/ individuality? “If I need to look like more of an adult” ? Quel age a-t-elle ? I adore this white dress !!! Nice style. These white sneakers are perfect for summer style. White is my favorite color and I have the same sneakers. I really love it. what are the sneakers please? Able to share some insight on who the dress is designed by? Hi Hannah. The dress is vintage, from The Break.